Convert 2007 Version for Excel converts XLSX and XLSM to XLS file format without requiring Excel 2007 or Excel 2010. 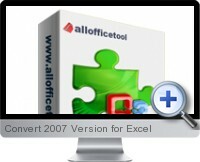 Convert 2007 Version for Excel can also batch convert XLSX and XLSM to XLS with professional quality and fast speed. The user friendly interface allows very easy use without any learning curve. Simultaneously convert different format files to XLS at once. Provide more detailed parameters settings to re size the output page. Supports adding the entire folder to convert. User friendly interface, easy to use with just a few clicks to complete the conversion. Fast conversion speed and excellent file quality. Save list of files to be converted for later conversion. Option to automatically open the output folder when conversion finished.